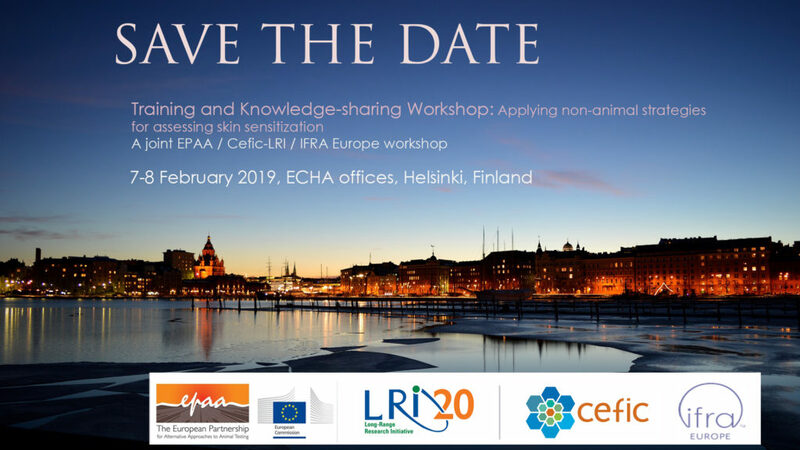 The training and knowledge-sharing workshop “Applying non-animal strategies for assessing skin sensitization” will take place on 7-8 February 2019, in Helsinki, Finland. The Workshop is organised jointly by EPAA, Cefic LRI and IFRA Europe. It will be hosted by ECHA, at their premises in Helsinki, and it is intentionally designed to take place back-to-back with the REACH Member States Committee meeting so that knowledge-sharing and interactions with the national regulatory experts are facilitated. The main objective of the Workshop is to discuss how the information produced from non-animal assays for skin sensitisation can be used in regulatory decision-making for hazard identification (classification & labelling) but also for risk assessment decisions, i.e. by taking potency into account. The programme foresees presentations and discussions in break out groups before final conclusions and recommendations can be agreed on the applicability or limitations of existing alternative approaches and eventual further work that may be needed. Following introductory presentations by EURL ECVAM and ECHA, the various industry sectors will present their experience in using non-animal assays. Representatives of the Scientific Committee on Consumer Safety (SCCS) and of the International Dialogue for the Evaluation of Allergens (IDEA) have also been invited to present their views. Please register by 23 January 2019 via email to zvonimir.zvonar@epaaind.eu to attend the Workshop (7-8 February) and the dinner on 7 February.